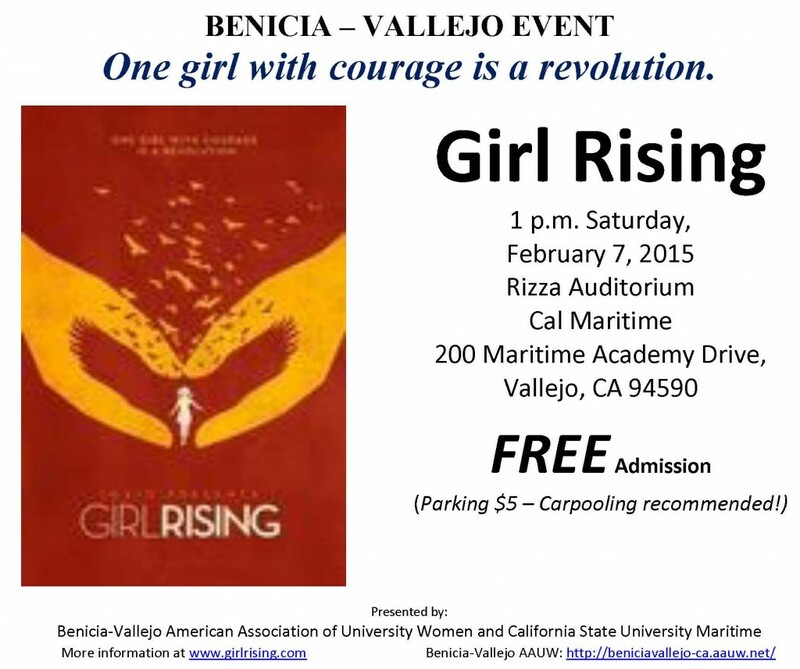 The Benicia-Vallejo branch of the American Association of University Women/AAUW and California State University Maritime will co-host a free showing of “Girl Rising” at 1:00 p.m., Saturday, February 7, in the Rizza Auditorium, 200 Maritime Academy Dr., Vallejo. The award-winning documentary promotes the power of education to change a girl – and the world. Nine unforgettable girls – striving beyond circumstance, pushing past limits – are spotlighted in this film. Each girl is unique, but the obstacles they face and their dreams of education are universal. Schools, community organizations and religious groups are encouraged to bring groups of girls, women, boys and men to see the film. Admission to the film is free – Parking at Cal Maritime is $5, carpooling is recommended. “Those attending will see that one girl with courage is a revolution. Educating girls transforms societies, for when girls are educated, communities thrive and economies grow. Girl Rising journeys around the globe to witness the strength of the human spirit and the power of education to change a girl – and the world,” said Cynthia Seguin, Benicia-Vallejo AAUW program coordinator. “We are proud to partner with Cal Maritime in promoting this significant documentary. We want it to spark many discussions about what education can do for girls to create positive change in Solano County and elsewhere. Both our organizations are committed to increasing educational opportunity,” added Seguin. Educators can access the film’s website, www.girlrising.com for a free standards-aligned curriculum to assist in student learning about important political, cultural, historical, economic, and geographic issues tied to educating girls — and about their responsibilities to their own communities and their role as global citizens. AAUW puts its mission – to support equity and education for all women and girls – into action. To learn more about joining the American Association of University Women, please contact https://beniciavallejo-ca.aauw.net/ or call Cynthia Seguin, 707-645-7066. Tax deductible donations may be made to AAUW California’s Special Program Fund at CA – AAUW SPF, and sent to: AAUW, P.O. Box 1876, Benicia, CA 94510. This entry was posted in Branch Events on January 29, 2015 by srsupport3.